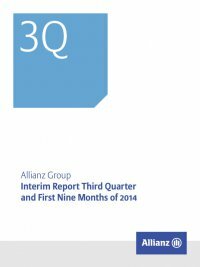 82 Interim Report Third Quarter and First Nine Months of 2014 Allianz Group 8 – Reinsurance assets Reinsurance assets € mn as of 30 September 2014 as of 31 December 2013 Unearned premiums 1,867 1,538 Reserves for loss and loss adjustment expenses 6,943 6,494 Aggregate policy reserves 4,809 4,463 Other insurance reserves 119 115 Total 13,739 12,609 9 – Deferred acquisition costs Deferred acquisition costs € mn as of 30 September 2014 as of 31 December 2013 Deferred acquisition costs Property-Casualty 4,620 4,354 Life/Health 16,200 15,837 Asset Management1 – 159 Subtotal 20,820 20,350 Present value of future profits 922 1,046 Deferred sales inducements 757 807 Total 22,499 22,203 1 The respective entities have been prospectively reclassified, effective 1 January 2014, from the business segment Asset Management to the business segment Life/Health. For further information, please see note 4. 10 – Other assets Other assets € mn as of 30 September 2014 as of 31 December 2013 Receivables Policyholders 5,677 5,489 Agents 4,629 4,424 Reinsurers 2,279 1,844 Other 5,028 4,160 Less allowance for doubtful accounts (700) (720) Subtotal 16,912 15,197 Tax receivables Income taxes 1,354 2,159 Other taxes 1,271 1,215 Subtotal 2,625 3,374 Accrued dividends, interest and rent 7,268 7,706 Prepaid expenses Interest and rent 18 13 Other prepaid expenses 300 255 Subtotal 318 268 Derivative financial instruments used for hedging that meet the criteria for hedge accounting and firm commitments 290 75 Property and equipment Real estate held for own use 2,507 2,423 Software 2,023 1,832 Equipment 1,251 1,173 Fixed assets of alternative investments 1,341 1,304 Subtotal 7,122 6,732 Other assets 1,470 1,280 Total 36,004 34,632 7 – Loans and advances to banks and customers Loans and advances to banks and customers € mn as of 30 September 2014 as of 31 December 2013 Banks Customers Total Banks Customers Total Short-term investments and certificates of deposit 3,440 – 3,440 3,275 – 3,275 Reverse repurchase agreements 90 – 90 613 – 613 Collateral paid for securities borrowing transactions and derivatives 633 – 633 315 – 315 Loans 57,4411 54,513 111,954 60,5111 51,595 112,106 Other 806 13 819 670 15 686 Subtotal 62,410 54,526 116,936 65,383 51,611 116,994 Loan loss allowance – (139) (139) – (194) (194) Total 62,410 54,387 116,797 65,383 51,416 116,800 1 Primarily include covered bonds.